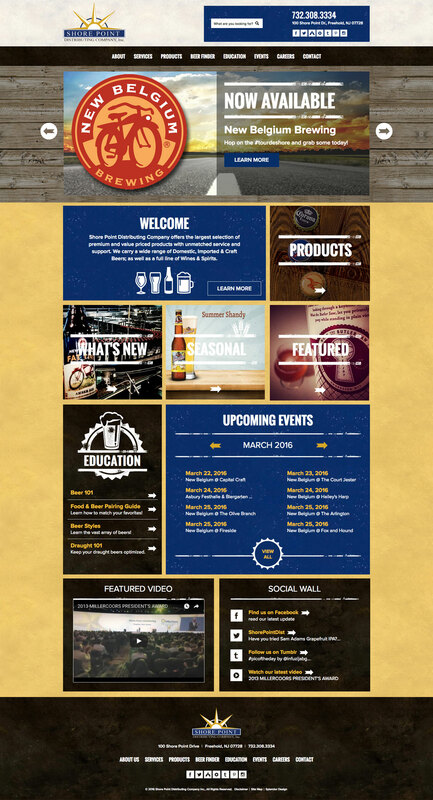 Shore Point Distributing, a known leader and large player in the liquor distribution sector, approached Splendor for a new website. Their old site, built in static html, was in need of a refresh. We embarked on a redesign to help reflect Shore Point’s longevity, knowledge and expertise. The audience for Shore Point Distributing is a diverse range of individuals. In terms of demographics, they target people in various lines of work from many diverse backgrounds. Our goal was to create a site with universal appeal. The primary industry we targeted is comprised of liquor stores, restaurants and bars and potential employment candidates. A secondary audience is the individual retail consumers themselves. Preserving their existing site copy and content, we incorporated eye candy that guides the visitor and tells the story of Shore Point Distributing. The dynamic new interface engages visitors and prompts them to dig deeper to read specifics about the business and brands they carry. The site features an age gate, news section, upcoming events, cycling slideshow, social wall, photo and video gallery. Additionally, we built a “Beer Finder” tool that allows visitors to search by brand, store and location. The website capitalizes on WordPress for easy backend edits, and publishing of important information by Shore Point’s internal staff. The CMS allows access to update virtually all areas of the website.